Award-winning musical theater composer Andrew Lloyd Webber (b. 1948) became interested in Victorian art at the age of eight. As he achieved success with his musicals, Evita (1976), Cats (1981), Phantom of the Opera (1986) and Sunset Boulevard (1993), he began to collect Victorian and Pre-Raphaelite paintings. His collection of Victorian art, assembled over a period of forty years and now one of the world’s largest in private hands, includes works by Dante Gabriel Rossetti, William Holman Hunt, John Everett Millais, Edward Burne-Jones, John William Waterhouse, John Atkinson Grimshaw, Giovanni Boldini, and James Tissot. Knighted by Queen Elizabeth II in 1992, Lord Lloyd-Webber spent 10 million on paintings during three weeks in 1994, according to the London Telegraph. All the Tissot paintings in his collection are from the artist’s London period, 1871-1882, and were purchased in the 1990s. As of 1989, the highest auction price on record for an oil painting by James Tissot was Reading the News (1874) sold at Sotheby’s, New York that year for $ 1,250,000/£ 797,295. Quiet (c. 1881) was exhibited at the Royal Academy in 1881. It was purchased by Richard Donkin, M.P. (1836 – 1919), an English shipowner who was elected Member of Parliament for the newly created constituency of Tynemouth in the 1885 general election. The small painting remained in the family and was a major discovery of a Tissot work when it appeared on the market in November, 1993, selling to Lloyd Webber at Christie’s, London for $ 416,220/£ 280,000. In perfect condition, it shows Kathleen Newton and her niece, Lilian Hervey (1875 – 1952) in the garden of Tissot’s house at 17 (now 44) Grove End Road, St. John’s Wood, in north London. It was Lilian Hervey who, in 1946, publicly identified “La Mystérieuse” – the Mystery Woman – as her aunt, Kathleen Newton. Uncle Fred (Kathleen Newton’s brother, Frederick Kelly, with his niece Lilian Hervey, 1879-80), previously had been in a private collection in Besançon, France. Lloyd Webber purchased the painting at Sotheby’s, New York in February, 1994 for $ 320,000/£ 216,802. It was Frederick Kelly, incidentally, who arranged Kathleen’s marriage to Isaac Newton, a surgeon in the Indian Civil Service on January 3, 1871, when she was seventeen. The marriage ended in divorce within months, and Mrs. Newton returned to England. She gave birth to a daughter at the end of the year, and a son in 1876, the year by which she began living with James Tissot in London. In October, 1994, Le Banc de jardin set another record for a Victorian picture – as well as a record to date for a Tissot painting – when Lloyd Webber purchased it from Fred Koch for $ 4,800,000/£ 3,035,093 at Sotheby’s, New York. 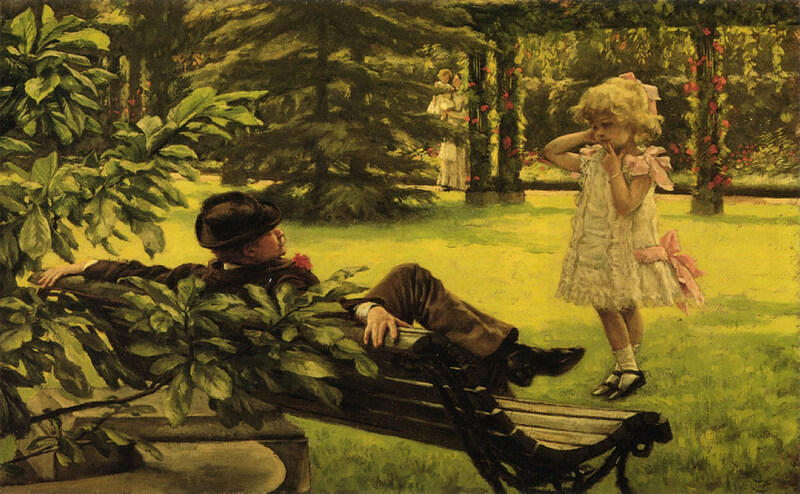 Lloyd Webber purchased The Widower (c. 1887), which Tissot exhibited at the Grosvenor Gallery in 1877, at Sotheby’s, London in November, 1994 for $ 122,587/£ 75,000. The Captain and the Mate (1873) features Margaret Kennedy (1840-1930), the wife of Tissot’s friend, Captain John Freebody, (b. 1834). Freebody was the master of the Arundel Castle from 1872-73, and his ship took emigrants to America. Margaret’s older brother, red-bearded Captain Lumley Kennedy (b. 1819), and her sister posed as well. 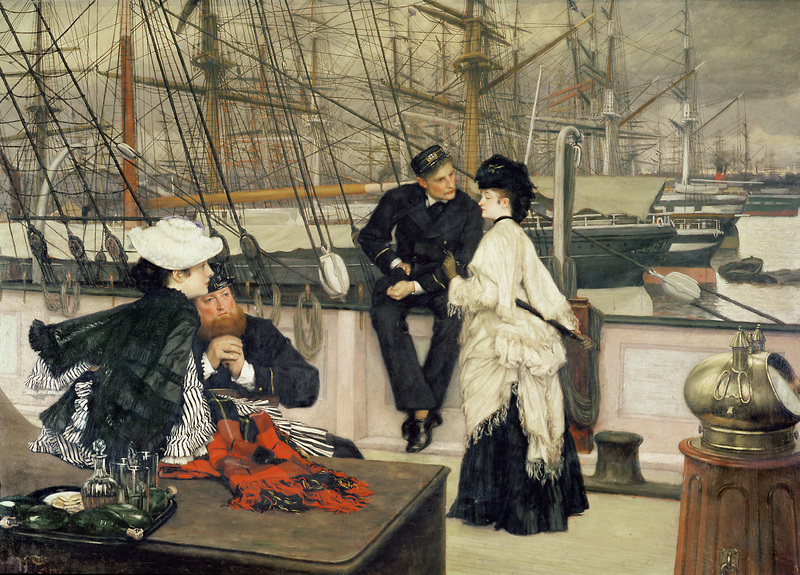 Tissot exhibited The Captain’s Daughter, The Last Evening and Too Early [both at the Guildhall Art Gallery, London] at the Royal Academy in 1873. Lloyd Webber acquired The Captain and the Mate in 1995. 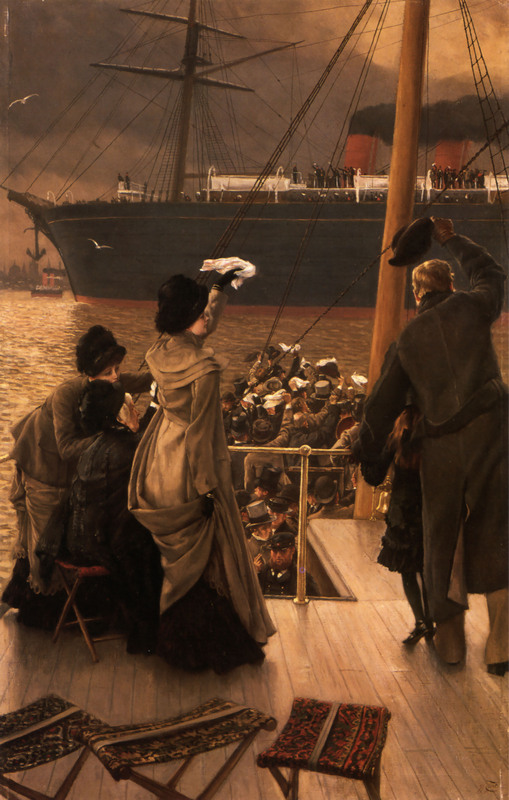 It is one of two paintings featuring Margaret Kennedy in private collections [the other is Boarding the Yacht (1873)]. 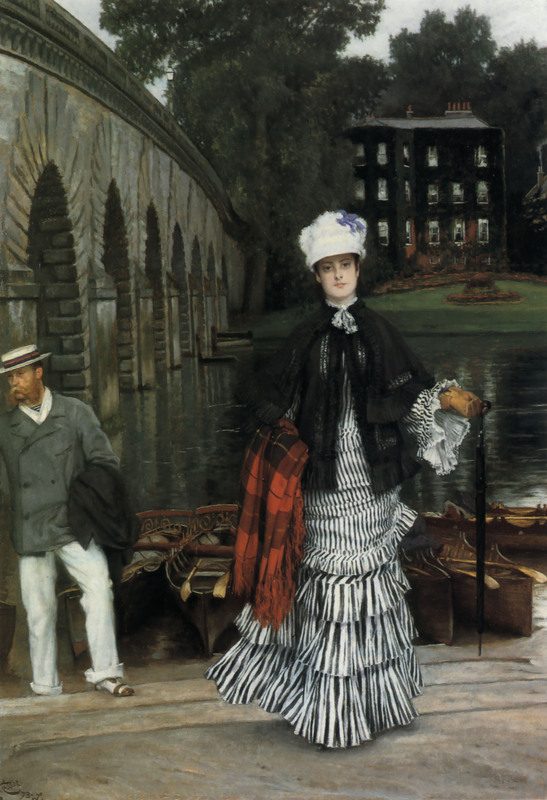 The Return from the Boating Trip (1873), one of dozens of Tissot oils that changed hands during the 1980s, was sold at Christie’s, London in 1982 for $ 31,852/£ 20,000. It was acquired by Lloyd Webber in 1995. Lloyd Webber acquired “Goodbye” – On the Mersey, which depicts well-wishers on a small local ferry waving at a Cunad steamer setting sail from the port of Liverpool, in 1997. 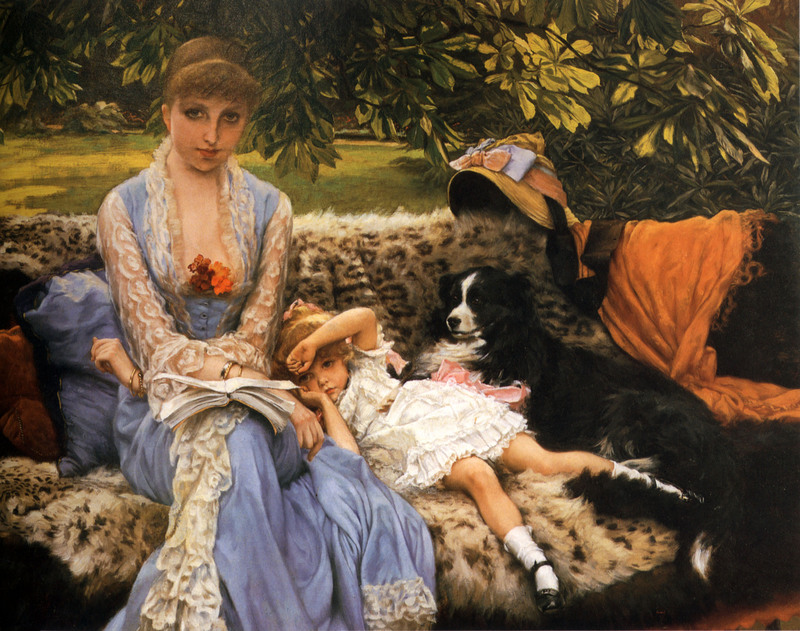 It is one of two known versions painted by Tissot, the other, larger of which was exhibited at the Royal Academy in 1881 and was sold from The Forbes Collection in 2003 to a private collector. Of course, the Tissot paintings form just a fraction of Lloyd Webber’s collection of Victorian art, but he owns more Tissot oils than the Tate Gallery in London. A 1995 plan for putting his collection on permanent public view, in a gallery on the South Bank within a new £50 million arts complex designed by Sir Richard Rogers and entirely funded by Lloyd Webber’s theater operating company, the Really Useful Group, was dropped. 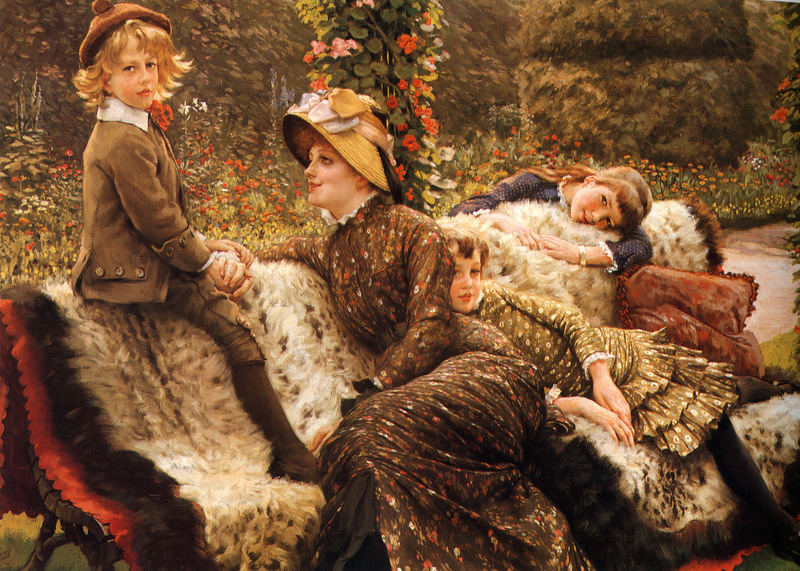 If only we’d bought James Tissot’s paintings in the 1970s! 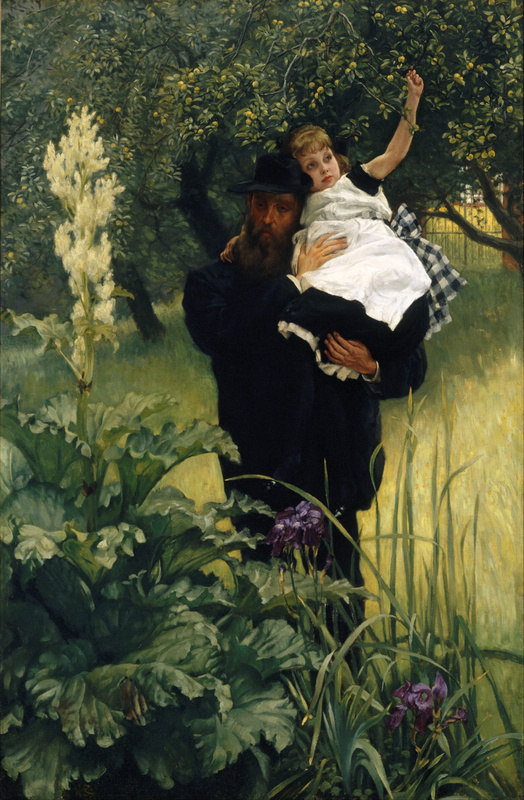 This entry was posted in Art blog, Art History, Impressionists and tagged Andrew Lloyd Webber, Cecil Newton, James Tissot, Kathleen Newton, Lilian Hervey, Violet Newton on September 12, 2014 by Lucy Paquette, author of The Hammock: A novel based on the true story of French painter James Tissot.